Since 1982. 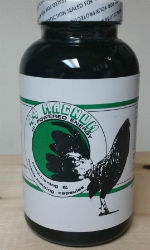 A high power energy supplement for roosters. This vitamin consists of 22 aminoacids, minerals, calcium, iron, potassium and magnesium. Contains Vitamin A, B1, B3, B5, B6, B8, B9, C, and E. This vitamin supplement is just what your rooster needs to keep in perfect shape.